This site is intended primarily as a communication resource for members and families of the Ambridge Area High School Band. Our intent is to continually update this site with pertinent information, so please check back often. We strongly encourage our members, parents and staff to sign up for the Remind App for additional ongoing communications. The Ambridge Area School District has a rich history that spans almost 100 years. The American Bridge Company (a division of US Steel) built the Ambridge Area High School for the children of its employees. As the district has grown with the area, weathering both good times and bad, we have strong ties to our heritage and to our community. From the early years of the steel mills to the current surge in businesses in the region, Ambridge Area School District has remained consistent in its commitment to providing the very best education possible to our students. 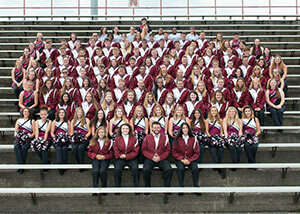 The Ambridge Area High School Marching Band is rich in tradition, with many of the school's students participating in the music program. The music they perform is unique because the students add their own personal mark to the performance, adding to the "show" quality that is the Ambridge Area High School Marching Band. The band's numerous honors include participation in the Tournament of Roses Parade in 2004, and several appearances at Steelers games, both during the season and in the playoffs. More recently, the band performed at Walt Disney World in 2014, and at the 75th anniversary of the attack on Pearl Harbor in November, 2016. The band returned to perform at Disney in December 2018. Ambridge Area Band Boosters, Inc.